"A collaboration of choreographers & dancers focused within the inner landscapes of the human psyche and soul", Jeanette Stoner & Dancers superbly performed Stairs set to my music April 29-May 2 2017 in Stoner Loft, 83 Leonard Street., Tribeca, NY. We are in the Boston Globe! Once You are Not a Stranger, my collaboration with Janis Brenner & Dancers received its American premiere April 8 at the Dance Hall in Kittery, Maine and will receive its NYC premiere June 1-3 at Gibney's Agnes Varis Dance Center in NYC. The multidisciplinary collaboration, featuring original music and video projections, examines the concept of empathy in our diverse world. On March 12, Composers Concordance and the American Festival of Microtonal Music, two long-standing organizations, joined together to co-produce a concert focusing on NYC composers writing microtonal compositions. Part of Composers Concordance's 6th annual festival 'New York // New Music', the concert included the American premiere of my piece Hard Rain, Johnny for bassoon and electronic sound, along with works by Dan Cooper, Gene Pritsker, Monroe Golden, Johnny Reinhard, Zach Seely, David Taylor, Joseph Pehrson. Once You are Not a Stranger, my new collaboration with Janis Brenner & Dancers, visual artist Eva Petric, and lighting designer Mitchell Bogard, premiered Feb 10, 2017 at the National Theater Sarajevo as part of XXXIII Sarajevo Winter Festival - The Silk Road Art. The work received the 2016 O'Donnell-Green Music and Dance Foundation, Inc. grant. On Jan 26 2017, the fantastic ETHEL quartet premiered my piece for string quartet, bass guitar and tape at (le) Poisson Rouge in NYC as part of Composers Concordance's 'RoundTable' concert. The event featured recent works by Dan Cooper, Melissa Grey, Peter Jarvis, Robert Levin, Milica Paranosic, Gene Pritsker, and Randy Woolf. A roundtable panel of celebrated artists, musicians, and poets, who who were onstage, provided commentary. The audience tweeted their immediate reactions to the music, which included several premieres. Tweets, favorable and critical, were projected live onscreen during the performance. On Dec 9 my piece The Period of Forgetting for piano, video and tape was performed by the excellent Marija Ilic in Miniatures Expanded, a concert of contemporary piano works at Spectrum in NYC. Also on the program were pieces by Michael Byron, Assaf Gidron, Peter Garland, Dean Rosentha, Craig Shepard, Michael Vincent Waller, Ernst Toch and John White. Much of my inspiration for Traces, commissioned by Carolyn Dorfman Dance, came from the late novelist Wallace Stegner's epigraph: "There is a sense in which we are all each other's consequences." On Nov 6 Traces was presented at the Bickford Theater in Morris Museum (NJ) and on Nov 22 the work received standing ovations at the Sarajevo National Theater. The fabulous musicians who helped me bring to life the 30-minute score are Susan Aquila, electric violin viper, Jacqueline Kerrod, electric harp, and Wylie Wirth, drums and percussion. I played the minimoog synthesizer and music directed. The Traces soundtrack features Philip Hamilton on vocals, myself on piano, vocals and zither harp, and David Rozenblatt on percussion. Traces received grants from O'Donnell-Green Music and Dance Foundation, Inc. and New Music USA, 2016 Live Music for Dance. Video by Kate Freer and Dave Tennent. Watch the short trailer here. On Oct 2 I showed work in the sold out Ladies First 2016: We're All Immigrants concert at Opera America in NYC. Thrilled! My collaboration with video artist Igor Molochev and pianist Marija Ilic was presented along the works by composers/performers Lynn Bechtold, Valerie Dee Naranjo, Jennifer DeVore, Adam Kent, Tania Leon, Nika Leoni, Cecilia Mandrile, Jessica Meyer, Tamar Muskal, Milica Paranosic, Kamala Sankaram, Michiyo Suzuki, Re'ut Ben-Ze'ev, Mioi Takeda, Susan Hwang, Karen Tanaka and Keve Wilson. I will be a guest artist at New School University's Public Engagement Schools in NYC on Nov 10. Excited about the topic: Where is the Work? in the series Sociology of Music co-presented with Assistant Professor of Sociology, Dr. Aleksandra Wagner. On July 26 I was a guest on TV Sarajevo's morning program where I enjoyed chatting with host Vanja Semic about my work and my recent liaising between New York and Sarajevo. I'll be bringing New York contemporary dance companies to the capital once again in November 2016 when Carolyn Dorfman Dance performs out latest collaboration, Traces. On June 17, pianist Jai Jeffryes gave a beautifully nuanced premiere of my piece The Period of Forgetting for piano and analog tape performed as part of Composers Concordance Presents 'Happy Birthday Otto Luening' held at Faust Harrison Pianos in NYC. The evening also included works by George Boziwick, Gloria Coates, Dan Cooper, David Shohl, Gene Pritsker, and Dave Soldier, and pianists Geoff Burleson and Eduard Laurel. The concert was the pic of the week in the I Care If You Listen new music zine. You can hear the piece here. Video by Eddie Papetti. For the last two Thursdays in May my music was played on SoundArt Radio 102.5 FM in Devon, UK. Curated by Ariane Delaunois, Hildegard to Hildegard is a weekly program featuring music by female composers ancient and contemporary, from Hildegard von Bingen to Hildegard Westerkamp. You can hear the 26-05-16 show here. The 19-05-16 program can be found here. My work for tenor, electronic sound and video projection was presented in Minneapolis April 23 2016. Tenor John De Haan sang the piece beautifully at Lloyd Ultan Recital Hall, University of Minnesota School of Music. Also on the program were works by David Esra Okonsar, Vassil Kazandjiev, Antun Tomislav Šaban and Dušan Bogdanović. This chamber concert series was created in 2003 by the Bulgarian cellist Nickolai Kolarov to showcase contemporary music inspired by the spirit of the Balkans. It was exciting to hear all the works! For more information please go here! Traces, my new commission from Carolyn Dorfman Dance premiered April 8 2016 in NJ at NJPAC. The New York premiere of the work took place April 16 2016 at the La Guardia Performing Arts Center (LPAC)! Traces received grants from O'Donnell-Green Music and Dance Foundation, Inc. and New Music USA, 2016 Live Music for Dance. My piece Sabih's Dream was selected for inclusion in the exhibit Pratt Upload/Patterns of the Mind at the Rubelle and Norman Schafler Gallery in Brooklyn, NY curated by Anna Frants of Cyland Media. From the catalogue: "Bukvic depicts an illusory, sensuous performance - a night fantasy, as Aristotle would say." On view Feb 6 - March 3. On Feb 12 I had the pleasure of talking with David Weinstein for Clocktower Radio in NY. Featured in Impossible Music, Svjetlana Bukvich, Beyond Evolution is an hour long conversation about my music, with excerpts from recent work. I received a new commission from the American Festival of Microtonal Music! Hard Rain, Johnny for bassoon and electronics will be premiered at the Micro-Fest in Berlin on February 18 by the virtuoso bassoonist Johnny Reinhard. Also on the program are works by Georg Friedrich Haas, Skip La Plante, and Harry Partch. For more information please go here. On Dec 11 I perform my music at the NYFA's 30th Anniversary of Artists' Fellowship Program celebrating the CD release of NYFA Music/Sound Fellows, The NYFA Collection: Volume Two. For more information please go here. I wrote about a new music event put together by Composers Concordance and a cohort of cutting-edge composers. The concert, A House of Many Rooms, featuring violinist Tim Fain with pianist Timo Andres took place on November 8, 2015 at (Le) Poisson Rouge, a downtown venue on Bleecker Street in NYC. Read the article in Modern Diplomacy International! Out Nov 13th! Happy to be part of this CD. "The follow-up to 2010's critically acclaimed NYFA Collection, The NYFA Collection: Volume Two collects works by the 2013 Music and Sound Fellows and presents a staggeringly broad swath of sonic territory: Fellini-esque circus music, a meditation on the exile of immigration status, guitar stabs and accordion solos, abstract jazz and new music piano, pop references, odes to molars and a bad storm, are just some of the paths explored by this diverse group of artists." Read the CD booklet here. On Oct 28 I was one of the featured composers on Music of our Mothers hosted by musicologist Ellen Grolman. Dedicated exclusively to broadcasting classical compositions by women across the centuries, the program airs live on Wednesdays from 1:00-3:00pm on WFCF 88.5 FM, Flagler College Radio in St. Augustine, FL. It also streams live on iheartradio.com. NPR-affiliate WFWM 91.9 FM airs the program on Fridays from 10:00am-noon. Thank you, Ellen! Excited to be part of The Chants Beneath Project, a monthly podcast premiering a total of 120 newly commissioned sonic works from some of the world's most exciting sound artists over ten episodes. Each piece makes use of, or responds to, a unique cassette-tape loop created by artist Jeremy Young. His Wave Farm (NYSCA) sponsored 125 artist edition double-sided loop pieces house 250 loops online in a freely streamable living archive. The program airs on WQXC 90.7 FM in Hudson New York every third week of the month. The project received a pretty little blurb in the WIRE magazine. Tattoo, an aria I composed for Carolyn Dorfman Dance, has been selected for inclusion in The NYFA Collection: Volume Two in celebration of the foundation's 30th anniversary. CD slated for release in November on Innova Recordings! Looking forward to kicking up some dust with Composers Concordance as one of the organization's new associate directors! Thank you, Gene Pritsker & Dan Cooper for the invitation! A bold and bright 16-concert season is in sight! "For the past 30 years, Composers Concordance has been a booster for local composers, through both its concerts across the city and a record label." - The Wall Street Journal. I have been invited to perform my music on July 1st at a Special Event at the United Nations by the Ambassador of Bosnia and Herzegovina. I will be performing for 190 United Nations delegates and representatives at the Economic and Social Council (ECOSOC). The event is commemorating the 8,000 innocent victims of Srebrenica, one of the towns which suffered during the war in Bosnia 1992-1996. Honored to represent my homeland at this event! Violinist Patti Kilroy will join me. New commission from Jeanette Stoner & Dancers! Stairs premiered May 2-5 in Tribeca, NYC, set to my electroacoustic score. We enjoyed a fantastic run! Thank you, Jeanette Stoner and Dancers, Carol Pelletier (custumes), Beo Morales (sound), and Zvi Gotheiner and Alex Kyle-DiPietropaolo (lighting). Nice to be included in V I S I B I L I T Y : female:pressure - an international network of over 1400 female artists from 65 countries in the wider fields of electronic music. This blog was inspired by Bjork's Pitchfork article in January 2015 where she notes the lack of photographic documentation of women at work. My new music ad art column is up and running in Modern Diplomacy International out of Vienna! You can read my first entry here. On March 25, I had a terrific time recording some new sounds of mine at The Bunker studio in Brooklyn NY with the Grammy-winning engineer Ariel Lavigna, violinist Eddie Venegas, and Grammy-winning producer Emilio D. Miler. What an experience in Sarajevo! Big thanks to the Sarajevo Winter fest, the National Theater in Sarajevo, Carolyn Dorfman Dance, the Academy of Dramatic Arts in Sarajevo, the American embassy in Sarajevo, the Jewish Community Center, Blow Up tech rental, and many other organizations who helped along, and loved the project we presented on Feb 22. Special thanks to newspapers Oslobodjenje, Gracija, Start, Faktor, Klix, Dnevni avaz, FACE TV, TV Sarajevo, Radio Sarajevo, and Voice of America (VOA) - start time 20:40 - for interviews and the coverage of the event. Most of all, thank you to the audience for their extraordinary welcome! Upcoming performance in Sarajevo! Svjetlana Bukvich and Carolyn Dorfman Dance Company A CONCERT OF NEW MUSIC, MOVEMENT, AND VIDEO ART comes to the National Theater on February 22, at 7:30pm as part of Sarajevo Winter Festival, now in its 31st season. On the program are electro-acoustic compositions from my latest release EVOLUTION, along with the world premiere of I Never Saw You Cry created for the very special electric violinist Melika Hadzic, hailing from Amsterdam. The terrific Carolyn Dorfman Dance will perform a collage of their signature pieces, along with the audience favorite, Interior Designs, for which I created the music. Tickets and info! On Dec 9 I had a solo show at Roulette, one of my favorite NYC new music venues! The concert included the world premiere of Waves - Where is my Baby? for viola, interactive video, and electronics, and featured special guest artists Igor Molochevski, Jessica Meyer, Chris Nesti a.k.a. Handcancel, Patti Kilroy, Kamala Sankaram, Susan Aquila, and Kevork Mourad. Thank you, ASCAP, for the mention in 2014 Selected Honors, Awards & Achievements in ASCAP Concert Music! My collaboration with the Carolyn Dorfman Dance Company, Interior Designs, was showcased October 26 at the lovely Bickford Theater in Morristown, NJ. The piece will be presented in NYC at the Alvin Aley American Dance Theater Jan 11, 2015 as part of The Association of Performing Arts Presenters (APAP). Roulette, one of New York's premier venues for new and adventurous art presents an evening of my music on Dec 9! Svjetlana Bukvich: Works from EVOLUTION and other stories is made possible by GENERATE: The Frances Richard Fund for Innovative Artists of Promise! New York's WQXR Q2 Music played my new album EVOLUTION on Her Music: Emerging Female Composers! KALX 90.7 FM and KPFA 94.1 FM, out of Berkeley, CA, gave it a spin in The Native Disinformant and Women Hold Up Half the Sky. I enjoyed presenting work at MicroFest Knin in Croatia along with composer/performers Philipp Gerschlauer, Jeroen Paul Thesseling, Jurica Jeliƒá, Johnny Reinhard, and Tolgahan Cogulu. Read the review here. In Serbo-Croatian/Bosnian. I was a guest in the studio talking about my new record on the Voice of America (VOA) TV program in Washington D.C. The interview starts at 24:50, and features clips with Cornelius Dufallo and Susan Aquila from my CD release show at the Cutting Room in NYC. Big thanks to the wonderful Inda Swanke, and Glas Amerike - Studio Washington! In Serbo-Croatian/Bosnian. Watch it here. A nice interview in Anatomy of Sound. Music from my new album EVOLUTION played on more stations - WOMR 92.1 FM, out of Provincetown, MA, WTUL 91.5 FM, out of New Orleans, LA, KALW 91.7 FM, out of San Francisco, CA, KXUA 88.3 FM out of Fayettewille, AR, WMBR 88.1 FM out Cambridge, MA, WCBN 88.3 FM, out of Ann Arbor, MI, and WWFM 89.1 FM out or Princeton, NJ. I received a new commission from the Carolyn Dorfman Dance! Traces is scheduled to premiere in spring of 2016, and recently enjoyed a successful work-in-progress showing at The LaGuardia Performing Arts Center (LPAC). The Year of the Horse, my concert at Spectrum on May 27, selected as critics' pick of the week by I CARE IF YOU LISTEN! Kaatsbaan International Dance Center presents Carolyn Dorfman Dance's Interior Designs set to my music on April 5! I received the 2013-2014 Faculty Development Grant from Pratt Institute for my collaboration with visual artist Igor Molochevski. Excited to share that my new album EVOLUTION will be released on Big Round Records, a PARMA Recordings label. EVOLUTION is available for pre-order and digital download on April 1, with the official release date April 29! Here is the album YouTube Sampler. Winter Music News! featuring downloadable preview track from EVOLUTION. Interior Designs, my collaboration with the Carolyn Dorfman Dance listed as one of the Top 10 Dance Events in 2013! [The Star-Ledger] Read full article here. Here is a nice blog PARMA Recordings posted about my 2013 NYFA Fellowship in Music/Sound. My piece "Sabih's Dream" was selected for the World Electro-Acoustic Listening Room W.E.A.L.R. as part of the 2013 New Music Festival: Voice in the 21st Century in California. Thrilled! I am a 2013 New York Foundation for the Arts Fellow in the category of Music/Sound. Fall Music News! I had a great time performing my multimedia work "Tattoo" on Oct 13 at the Serial Underground/C&C Piano Factory presented by Composers Concordance (enterprising new music organization-NYTimes) and Composers Collaborative Inc (inventive and innovative-NYTimes) at the Cornelia Street Cafe in NYC. Nice feature article in the special issue of Gracija magazine covering the Sarajevo Film Festival, along with the interviews highlighting festival guests Danny Glover and Armand Assante. In Serbo-Croatian/Bosnian. Recent interview I gave to Sanja Damic for the SBS Australian Radio. Part I - my journey from Sarajevo to NY, and Part II - time in NY. In Serbo-Croatian/Bosnian. Here is an extensive interview with me in the recently released book "In Her Own Words - Conversations with Composers in the United States" (University of Illinois Press). 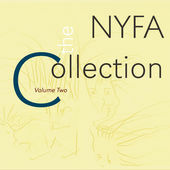 Meredith Monk, Pamela Z, Jennifer Higdon, Tania Leon, Chen Yi, Joan Tower, Toshiko Akiyoshi, and Pauline Oliveros are among the twenty-five artists portrayed in this extraordinary collection, which "substantially advances our knowledge of the work, experiences, compositional approaches, and musical intentions of a diverse group of creative individuals." Also available on Barnes&Noble and Amazon. Had a great time performing a live score on minimoog with with bassist Dan Cooper set to my film "If Swallows Came Back" at the Bohemian National Hall in NYC. The event Ladies First 2013 - tell it like it is featured journalists and writers paired with some of NYC's most adventurous composers! The food was terrific too. The New Yorker's pick - May 24 at Spectrum, NYC - I performed two recent works for minimoog, electronics and voice during a night of poly-microtonal delights presented by the American Festival of Microtonal Music! Coloratura soprano Kamala Sankaram and violinist Julianne Klopotic joined me. Also on the program were pieces by Miguel Frasconi, Jurica Jelic, Johnny Reinhard, John Eaton, Peter Thoegersen, and Igor Stravinsky. Spring Music News! Our Net News and Sublime Video were kind to offer two clips from my recent concert at Spectrum, NYC! Here is Rob Schwimmer on theremin playing an aria from my recent score for Carolyn Dorfman Dance. Soundtrack features soprano Kamala Sankaram and yours truly on piano and synth. Watch me perform "Back to the Heart-Planet" at Spectrum here! I'll be performing two sets of my music at Spectrum in NYC on April 28 at 7:30pm. The very exciting Rob Schwimmer on theremin, Mordy Ferber on electric guitar, Cornelius Dufallo, Julianne Klopotic on violin, and vocalist Samille Ganges will join me. Excited about my first round of rehearsals with Carolyn Dorfman Dance. A new commission from CDD for the company's Celebrate 30! Performance Gala, "Interior Designs" involves vocal ensemble and electronics, video body mapping, integral lighting and projections. The piece premieres April 13 and 14 at Wilkins Theater in Union, NJ and at La Guardia Performing Arts Center (LPAC) in NYC, May 17 and 18. With vocalists Kamala Sankaram and Samille Ganges. The piece is the recipient of the New Music USA, 2013 Live Music for Dance grant. For tickets and info go here. My piece "You Move Me" was chosen as "Best of 2012!" - Anatomy of Sound, Omladinski Program BH Radio 1. Thank you DJ Vuk! Writing some new tunes with bassist Patrick Derivaz. Moog and bass. In love with this stuff! Joe's got magic! Joe Lambert did a fantastic job mastering my new album "Evolution". I'm smiling wide. The multiple Grammy Award winning team, David Frost and Tom Lazarus, mixed my new album "Evolution" at the terrific Stadiumred in New York City. I had an absolute blast!! The album was recorded at NYU's Dolan Studio, Harvestworks in NYC, and Sarajevo's Amadeus, with some of New York's top avant-garde, jazz, and prog rock players. Martha Mooke on electric viola, Tony Levin on electric bass, Ha-Yang Kim on cello, Mordy Ferber on electric guitar, Gareth Flowers on trumpet, Susan Aquila on Viper electric violin, Nikola Radan on alto flute, Johnny Reinhard on bassoon, and Leonardo Suarez Paz and Cornelius Dufallo on violin, among others, shared their magic! Paul Geluso engineered, while yours truly produced, designed the record's tuning, and played with minimoogs, electronics and voice. Stay tuned for videos from the sessions, news on the album release date, the release party, and much more! Cornelius Dufallo (formerly of radical string quartet Ethel) gave a superb performance of my piece "Before and After the Tekke" at Bargemusic in NYC! Also on the program were works by Kinan Azmeh, Paul Brantley, Jacob TV, Patrick Derivaz, Tim Hodgkinson, and Cornelius Dufallo. Dufallo recorded the work earlier this spring for my upcoming album. Read the review of the performance. Watch the video! For more summer news go here. Carolyn Dorfman Dance Company danced to my track "Secret [Clockwork remix]" at Mark Morris Dance Center in Brooklyn in "Up Close and Personal", an evening of contemporary dance and conversation, with live performance by cellist Jessie Reagen Mann. The in-real-time audience feedback gathered during the performance will inform the creation of "Interior Designs", my new collaboration with CDDC! I enjoyed performing a program of new works at the Music with a View Fest 2012 in Tribeca! Violinist Patti Kilroy of Cadillac Moon Ensemble joined me in the sympho-rock meets Middle-East-electronica set for amplified strings, Minimoog, electronics and voices. The Q&A session after the performance was moderated by Eleonor Sandresky. Here is a great review of the concert! Watch the video. My April 28 sold-out premiere was a success! People said: Meredith Monk, Laurie Anderson and Led Zeppelin, all-in-one! And I said: I love it!! Special thanks to conductor Jennifer Kelly for her vision and artistic excellence, the Lafayette College Concert Choir for giving from the heart, and the Alan and Wendy Pesky Artist-in-Residence Program for commissioning the work! Watch the video! For more spring news - reviews, projects, and upcoming performances - go here. As the Alan and Wendy Pesky Artist-in-Residence at Lafayette College in Easton, Pennsylvania (2011-2012 academic year) I met some wonderful folks, conducted computer music labs, spoke on panels - Creativity, and Gender in the Arts - and gave lectures. The world premiere of my Lafayette commission "Back to the Heart-Planet" for mixed chorus, electronics, electric bass guitar and drum set will take place on April 28, 8pm at the Williams Center for the Arts. I had a great time performing my music at Drom in New York City as part of the Composers play Composers Marathon, one of the six Composers Concordance Festival 2012 events with some of the most eclectic contemporary musicians around. To "touch the stars on a horse" in "Sabih's Dream", I offered a mix of electronics, amplified violin, my voice, and the Minimoog. Violinist Leonardo Suarez Paz, Astor Piazzolla's disciple, and the master of all things tango, joined me. The soundtrack featured Martha Mooke on electric viola, Ha-Yang Kim on cello, and Tony Levin on bass. Thank you to all who attended! Here is a great review of the performance. Watch the talk I gave at University of Michigan's Center for Russian, East European, and Eurasian Studies (CREES), Ann Arbor, about the updated contexts of Balkan ethnic music, symphonic and progressive rock in Sarajevo in the 70ties and Goran Bregovic's album "Silence of the Balkans". Happy with how well it was received! More fall news here. Here's the write-up for the lecture. It introduced the concert of Goran Bregovic & His Wedding and Funeral Orchestra as part of the University Musical Society (UMS) 2011-12 season. Consequently, I have been asked by Carnegie Hall to write about Goran Bregovic for the publication Playbill and his Stern Auditorium debut on October 19th.